My holidays may be over, but it doesn’t mean I can’t escape to the Italian Riveria. The Parlour Bar in Canary Wharf has opened an al fresco Peroni Bar just in time for summer and we went down to try it out! It was a bit chilly when we visited The Parlour last week so we opted to sit in the warm but this didn’t mean we missed out on the whole Peroni Bar experience. The Parlour was absolutely buzzing on a Tuesday evening and we were told that it’s much busier than this on a Friday – I can’t even imagine! The atmosphere was great and I believe we were tendered to by the friendliest staff I have ever met in London. The Parlour is open for breakfast, brunch, lunch, dinner & drinks and the new Peroni bar offers Peroni on-tap and innovative beer cocktails. 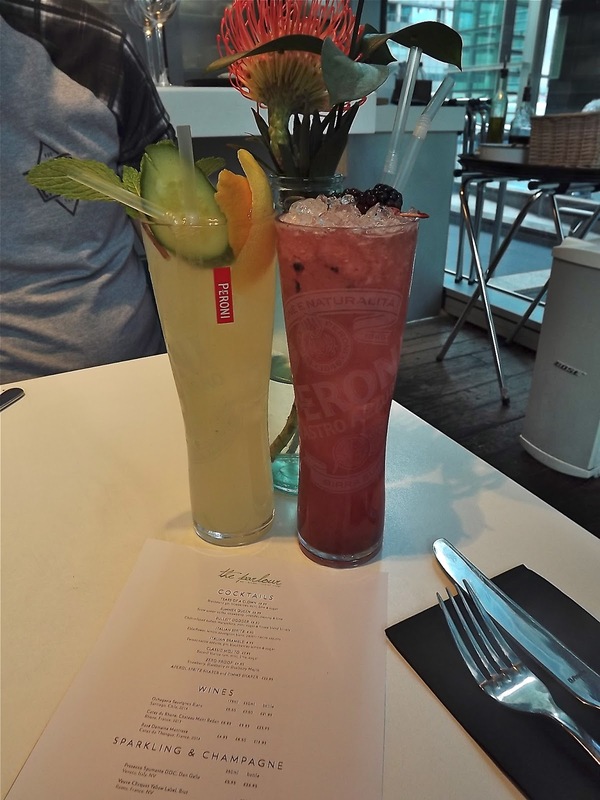 We started off with the the Italian Bramble (£8.95) pictured mixed with lemon, gin, Peroni and Crème de Mure liqueur with blackberries and the Italian Spritz (£8.50) sweetened with elderflower and Sauvignon Blanc and garnished with cucumber, citrus peel and rosemary. You may think beer cocktails or wine and beer mixed together…what the!? But it works really well, a little bit too well. You can sit and sip the Italian Spritz all night and it’s not until you stand up that you realise that there was actually alcohol in it. The Italian Spritz was the highlight of the evening for both of us. To go alongside the cocktails we sampled the Meat Platter (£19.95) which was huge. So huge that even I (the greediest girl ever) had to leave most of it to Karl. The platter included chorizo (absolute fave), mini hamburgers, onion rings, chips, satay chicken with peanut butter sauce and scotch eggs made with black pudding. Everything was absolutely delicious. We went on to a try a few of the cocktails, I went for the Tears of a Clown cocktail which is made up of gin and Riesling. I’ve always been a fan of unnaturally coloured drinks which resemble slush puppies so this was a winner for me. The Parlour explained to us that as the Peroni bar is outside the drinks have to be served in plastic cups for safety reasons. The Peroni cup for the Italian Spritz and Bramble cocktails resembled glasses, you would not think you were drinking out of a plastic cup. Also plastic cups didn’t mean the cocktails tasted any less delicious. The cocktails are perfect for this time of year – light, refreshing and summery. If you really want to feel like you are in Italy then you can get a cocktail or sharing pitcher of Aperol Spritz £22.95, serves three) from the bar. I cannot thank the staff at The Parlour Bar enough for such a fantastic evening, they really made us feel at home. I’ll definitely be back again! Also they heard it was my birthday coming up, so treated me to a little something. How sweet is that? If you want quirky cocktails, good food and a place full of atmosphere then I cannot recommend The Parlour Bar and Peroni Bar enough. It is located a two minute walk from Canary Wharf station, which although on the other side of London for me, it is really easy to get to from West London. I have to pop to Canary Wharf for meetings now and then so I think I may have just found a new after work drinks hangout.